pazham pori or ethakka appam recipe is a popular street food snack from kerala made with ripe bananas. pazham pori recipe with step by step pics. 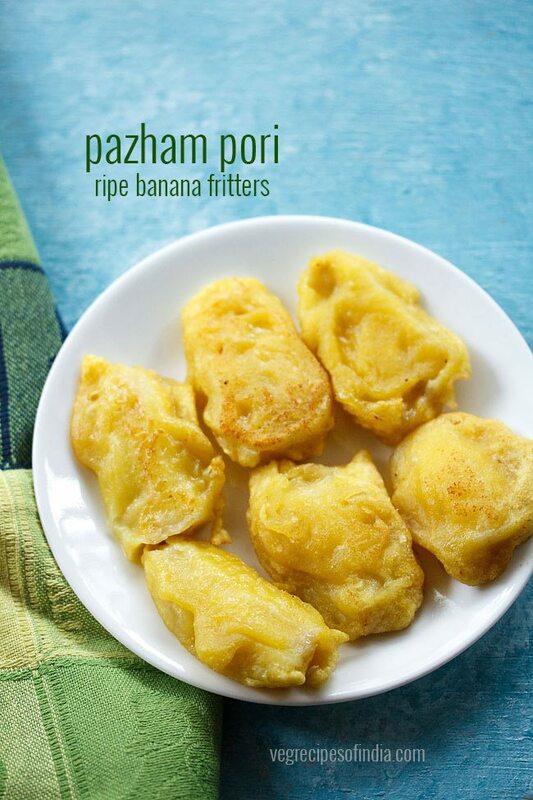 pazham pori is a popular snack from kerala made with ripe bananas. 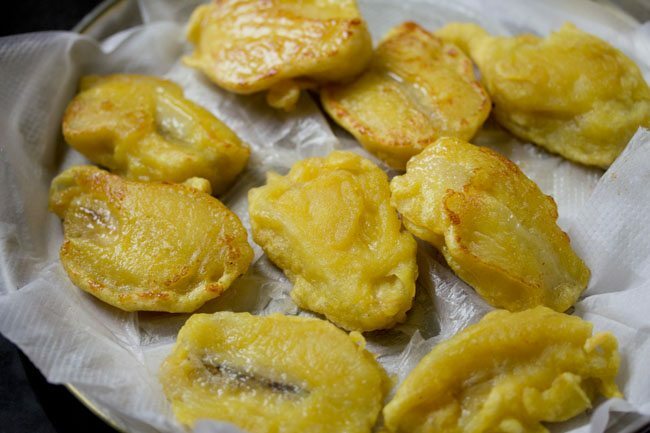 banana slices are coated in an all purpose flour batter and then deep fried. the bananas used to prepare pazham pori are nendram pazham. 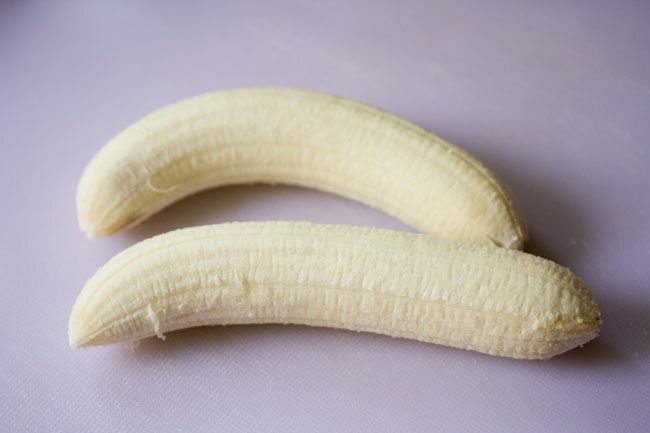 these variety of bananas are long, large and are firm even when ripe. 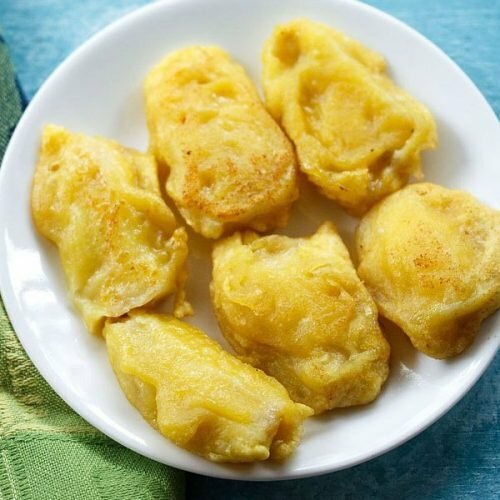 they are used not only to make the famous kerala banana chips but also these fritters. now this nendram pazham or ethapazham is not easily available everywhere in india or outside india. so you can use firm ripe bananas. do not use bananas which are too ripe or very soft. 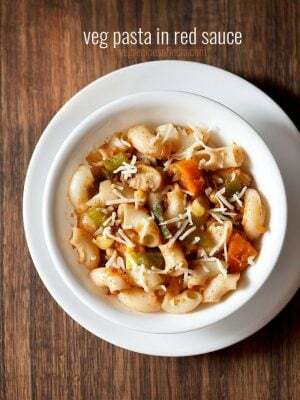 in the recipe also i have used ripe bananas which are sweet and yet firm. if using nendram pazham, then use the ripe ones. my mom used to prepare these sweet banana fritters on occasions as an evening snack for us. also during my stay in kerala, the hotel where we lived would serve pazham pori at least twice or thrice a week in their complimentary evening snacks menu. apart from pazham pori, there would also be paruppu vadai, banana bajji, sandwich and bonda. 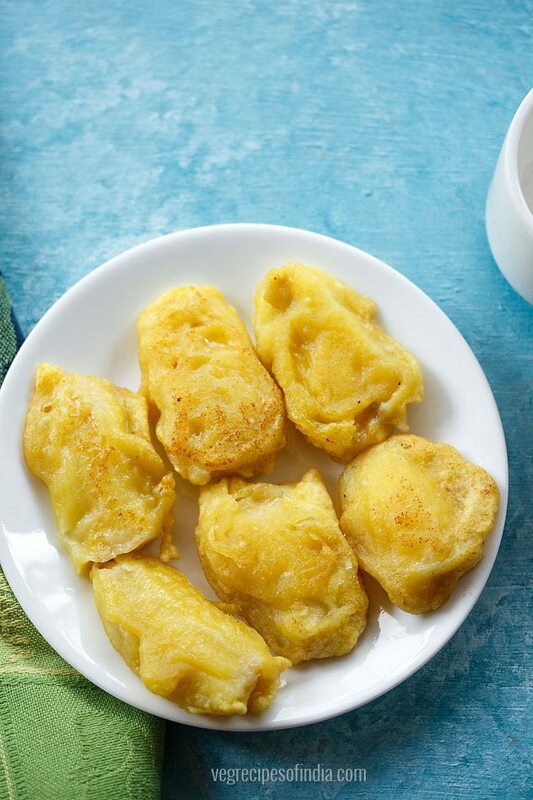 preparing these banana fritters are very easy. maida or all purpose flour is used for the batter. so do try to use organic maida or unbleached maida. for health reasons, you can use whole wheat flour too. also some rice flour can be added to the batter to make the fritters crisp. serve pazham pori as an evening snack with chai or filter coffee. 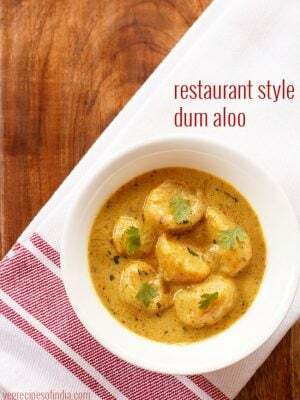 in a mixing bowl, take ½ cup maida, 1 tablespoon sugar (optional), a pinch of turmeric powder and a pinch of baking soda. then add water in parts. i used ⅓ cup water. 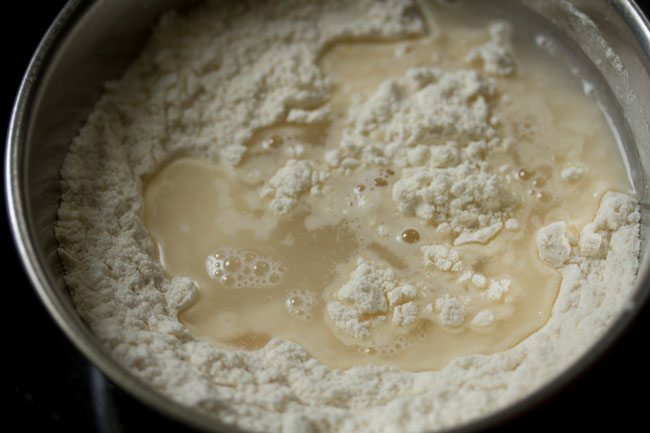 depending on the type of flour, you can add less or more water. 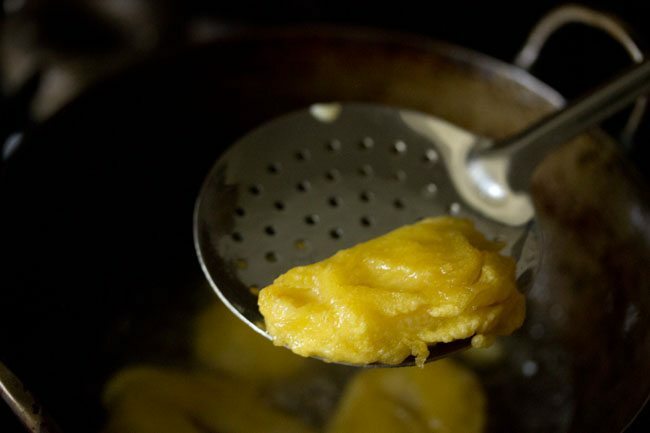 if batter becomes thin, then add some more maida. mix to a smooth batter without any lumps. the batter consistency is slightly thick so that it coats the banana slices very well. keep aside. then first slice them in half or quarters. then slice each piece vertically in two equal parts. heat oil for deep frying in a pan or kadai. 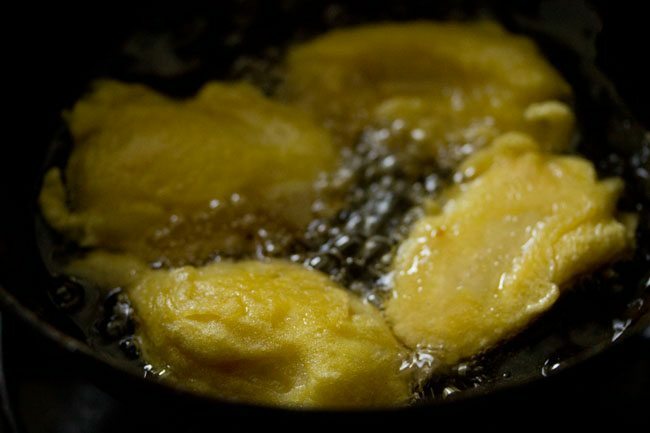 when the oil become medium hot, then the banana fritters can be fried. 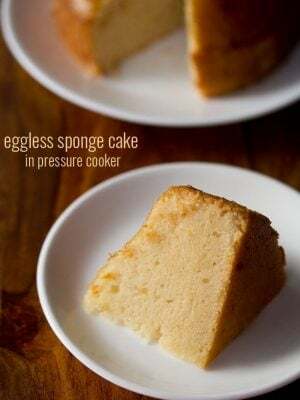 dip each slice in the batter and coat it well with the batter. gently place the batter coated banana slices in medium hot oil. fry the slices depending on the size of the kadai or pan. when one side is cooked, then turn over gently and fry the other side. fry till both sides are light golden. you don't need to fry these fritters too much. stop once the bananas start oozing out moisture into the oil and the oil begins to splutter too much. we just need to fry till the outer coating is done. a light golden is fine. keep the fried banana fritters on kitchen paper towels. in the same way, fry the remaining banana slices. you may see some caramelisation happening on the remaining banana fritters. this is due to the moisture and sugars which have leeched into the oil while frying the first batch. prepare the pazham pori in the same manner and keep them on kitchen paper towels, so that the excess oil is soaked up. serve pazham pori or ethakka appam hot as an evening snack with chai. 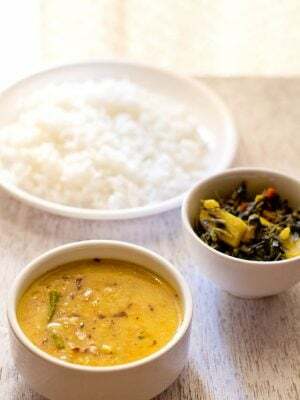 1. in a mixing bowl, take ½ cup maida (all purpose flour), 1 tablespoon sugar (optional), a pinch of turmeric powder and a pinch of baking soda. 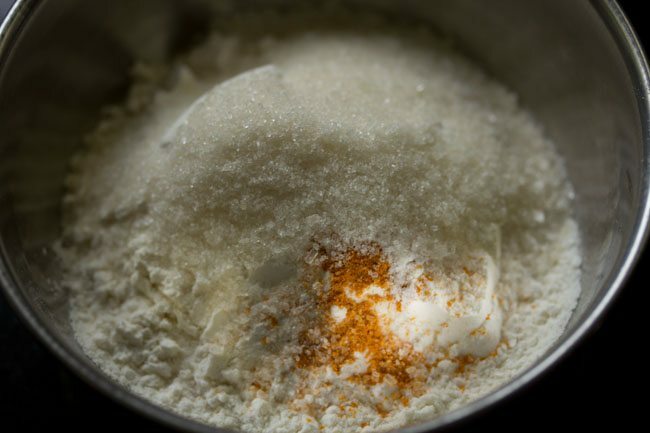 you can also add 1 tablespoon rice flour for some crispiness. 3. then add water in parts. i used ⅓ cup water. 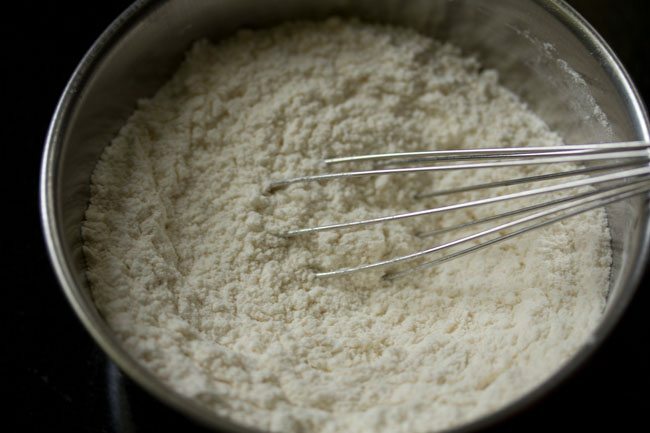 depending on the quality of flour, you can add less or more water. if batter becomes thin, then add some more maida. 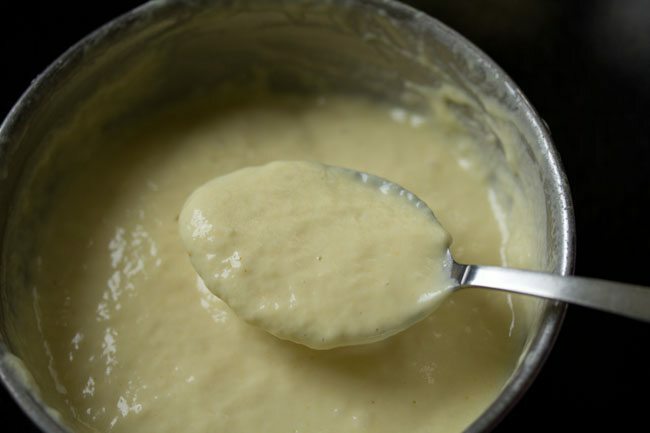 4. mix to a smooth batter without any lumps. 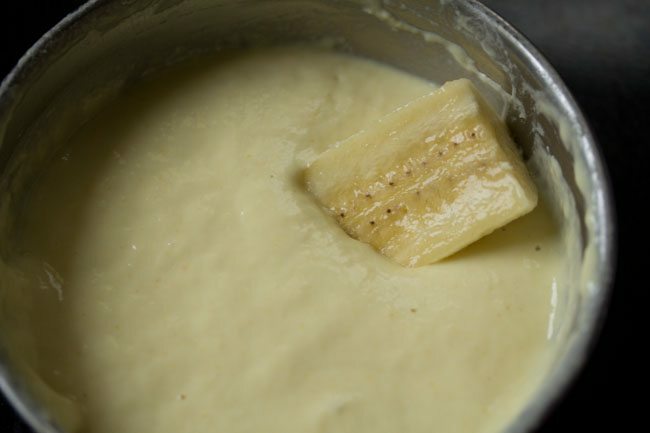 5. the batter consistency is slightly thick so that it coats the banana slices very well. keep aside. 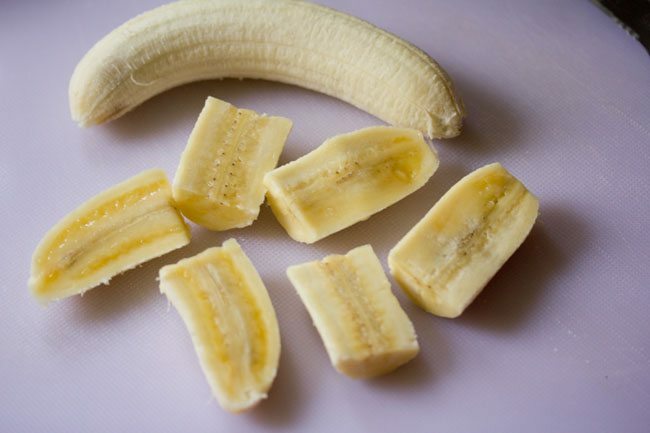 6. peel two large bananas or 3 medium sized bananas. 7. then first slice them horizontally in half or quarters. then slice each piece vertically in two equal parts. 8. heat oil for deep frying in a pan or kadai. 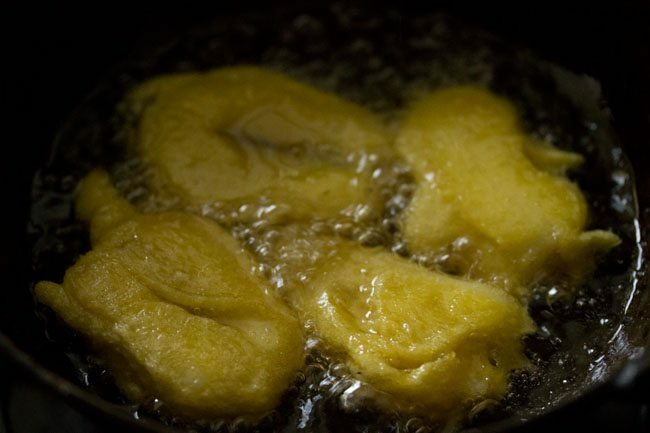 when the oil become medium hot, then the banana fritters can be fried. 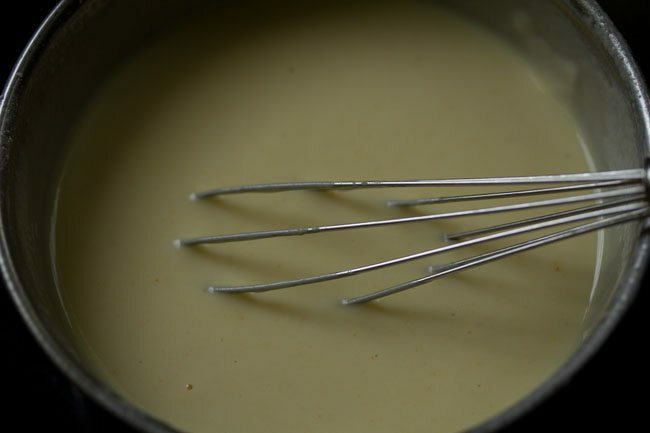 dip each slice in the batter and coat it well with the batter. 9. gently place the batter coated banana slices in medium hot oil. fry the slices depending on the size of the kadai or pan. 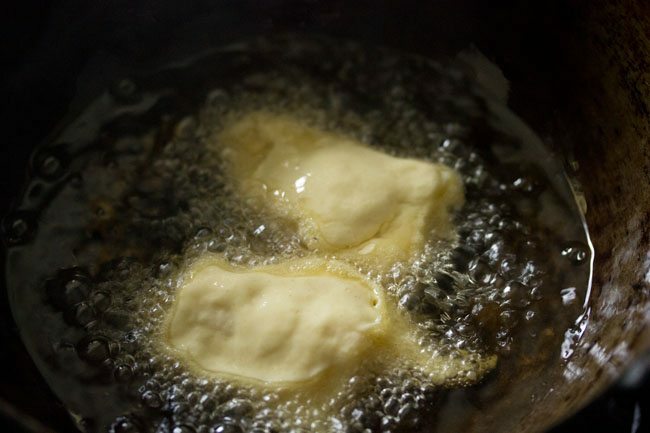 10. when one side is cooked, then turn over gently and fry the other side. 11. fry till both sides are light golden. you don’t need to fry these fritters too much. stop once the bananas start oozing out moisture into the oil and the oil begins to splutter too much. we just need to fry till the outer coating is done. a light golden is fine. 12. remove with a slotted spoon. 13. keep the fried banana fritters on kitchen paper towels. in the same way, fry the remaining banana slices. you may see some caramelisation happening on the remaining banana fritters. this is due to the moisture and sugars which have leeched into the oil while frying the first batch. prepare the pazham pori in the same manner and keep them on kitchen paper towels, so that the excess oil is soaked up. 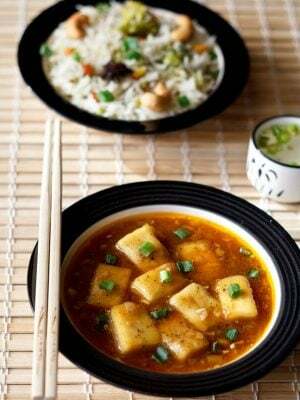 14. serve pazham pori hot as an evening snack with chai. hello dear, can v substitute baking soda wid baking powder? thanks a lot for d loveliest recipes around.. when r u pls sharing rajasthani dal baati and choorma recipe?? taru, in this recipe you can easily add one or two pinches of baking powder. thanks and i will try to add both rajasthani dal baati and choorma soon. wow how does it tastes? 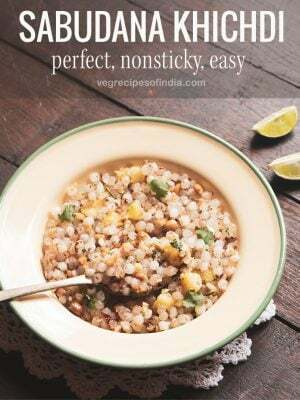 Will have to go to Kerala or try it myself by cooking it through your easy recipe and step by step useful guidance..
it tastes very good. of course with nendram bananas the taste is awesome. 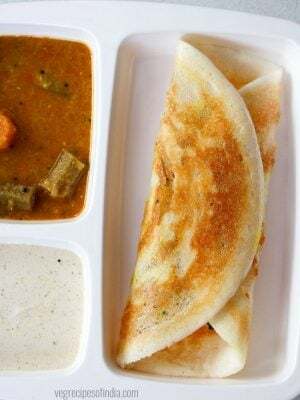 the mushy and sweet texture of the cooked bananas accompanies the crisp and soft texture of the maida layer very well.